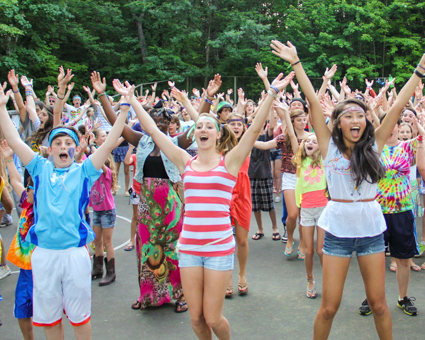 From Blue & White Day to Olympics & Kollege Days to Gold Rush and Casino Night, Kamp Kohut is jam-packed with tons of exciting events beyond the incredible daily schedule. Once a week we enjoy an awesome “Blue & White” Day. This is a fun-filled day of games, songs, and earning points for your team. With something for everyone, it is the perfect balance of teamwork and individual participation. For example, if a camper enjoys climbing, he/she might try to earn team points by conquering a specific route on the Climbing Tower; waterskiers might ski a slalom course; soccer players might play in a match. In the afternoon, we typically have a themed event, where the entire camp gets involved in a fun game of some sort. 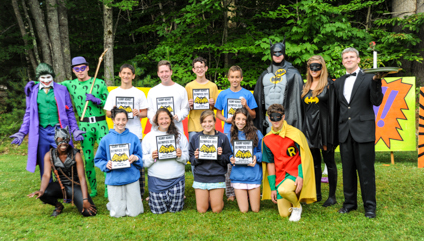 Counselors dress as fun characters and perform skits, much to the enjoyment of the camper audience. The afternoon then involves solving something like riddles in a camp-sized game of “Klue,” finding hidden treasure in a Wild Western “Gold Rush,” or building pirate galleons in a game of “Shipwreck.” Each summer & session offers something new and exciting! Towards the end of each 4 week session, we enjoy a fabulous three-day extravaganza which we call “Olympics” First Session and “Kollege Days” Second Session. These fun three days of games, puzzles, cheers, and low-key competition are eagerly awaited and begin with dramatically creative “breaks.” The themes are kept top secret by our Program Department, building much excitement and anticipation over the summer. We wrap up each Olympics and Kollege Days with the long-held tradition of “Song Fest,” where teams perform cheers and friendship songs, remembering what’s truly important about camp: our friends and fun times together. 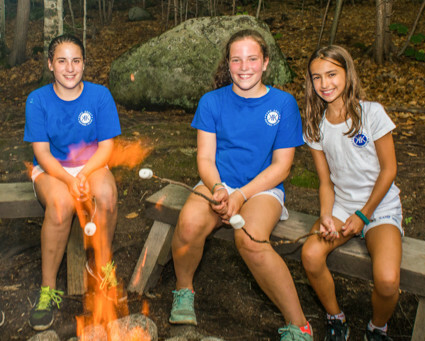 Evening Activity is a time to be with bunkmates doing all sorts of fun things, from making s’mores and talking around campfires to treasure hunts, sunset sails, radio shows, group games, and lots more. It is one of the few times activities are assigned by the Leadership Team. This is a great way for us to ensure that bunk groups get valuable bonding and team-building time, and are gently exposed to a variety of different areas around Kamp. 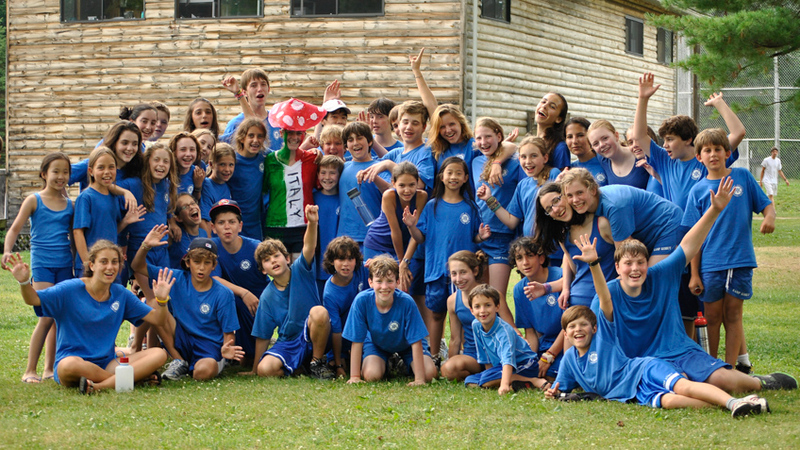 Campers may choose to participate in occasional “intercamps,” which are friendly competitions against other camps in the area. Intercamps are typically athletic events, such as soccer matches, baseball games, or basketball tournaments. 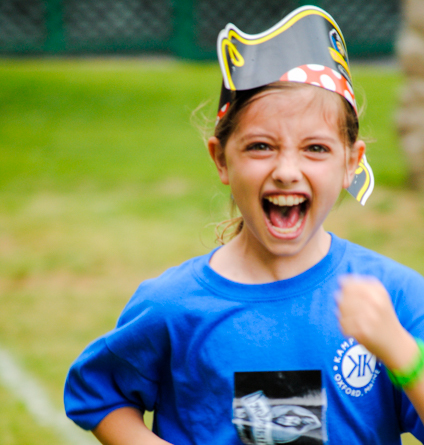 Intercamps are scheduled based on interest and age and are completely optional. There are no “try outs” for any of our intercamp teams, but rather sign ups. Everyone is welcome to participate. Community service opportunities vary from year to year, based on particular camper interest and availability. Potential activity examples include fundraising for terminally ill children to attend a special camp, environmental conservation, and local volunteering.